Monumental building in the heart of Vlissingen near the sea, boulevard and restaurants. Lovely spacious apartment with private entrance close to water, center, restaurants. 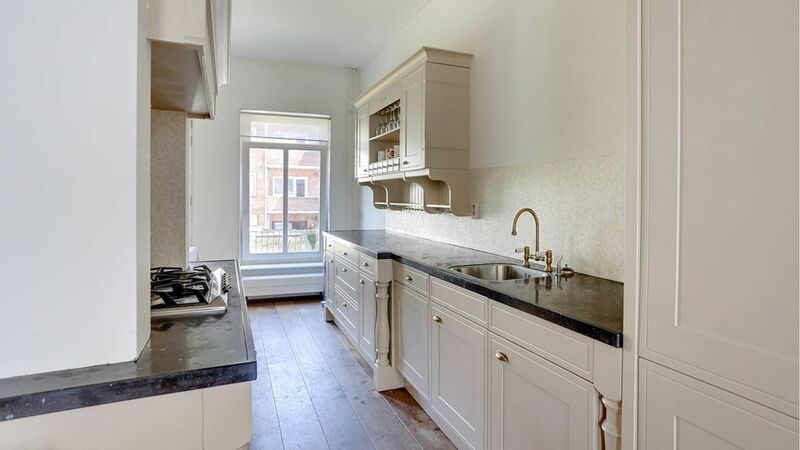 Right in the bustling city center of Vlissingen in the shopping street you will find this beautiful and unique well renovated apartment with Art Nouveau appearance. There is a private entrance with spacious balcony and the house is 100m2. The house is fully equipped for 4 people. Under the apartment is the studio of the owner Agnes den Hartogh located on the ground floor. If she is present you can always contact her for advice or a fun workshop. The house is rented in its entirety to the guests who have the 1st and the 2nd floor available. So there are no other tourists in the building. Has been completely restored and modernized in 2007.
children are welcome, small cot / high chair can be used against payment. Hooger Wal is 500 meters from the boulevard and 800 meters from the beach of Vlissingen and 300 meters from the Bellamypark, the city's catering square. The shops, the cozy terraces at the Bellamypark, the boulevard and the beach are just a stone's throw away. At 200 meters you will find the marina, the arsenal and the Muzeeum. Cinema Xl is 700 meters. There is a parking permit policy for our guests in the area. A free parking permit is also available. You do not have to go far to park. Also shopping is within walking distance. The train station and the ferry to West Zeeuws Vlaanderen is located at a distance of two kilometers from the house. The first floor via a private staircase to the own front door. A landing with the first toilet leads to the living room. Because the living area is on the first floor, you have complete privacy. This is spacious and equipped with a seating area at the front and a dining area at the rear. The house is attractive also because of the old renovated ceiling beams From the dining room is a spacious balcony available. The large stylish open kitchen has plenty of storage space and various appliances such as dishwasher, refrigerator, Smeg stove and oven, microwave, kettle and Senseo coffee machine. Of course with free wifi, everywhere central heating and a modern TV. With a fixed staircase you reach the second floor. There are two spacious bedrooms on both the front and the back, both with several windows. The double bed in the back room is 180 wide and has two separate mattresses. The back room has two single 90 cm wide single beds. The bathroom is nicely tiled and equipped with a separate shower, a separate bath, a toilet and a sink. There is also a washing machine separately on the 2nd floor. If a small child comes along, the two bedrooms are spacious enough then we can take care of costs for a cot and a highchair on the spot. Please indicate this in advance. Besides the fact that Vlissingen offers everything within walking distance there are: boulevard, museum, recreation, hunting, shed and fishing ports. Shops, cinema, beach and old monumental buildings. The environment also offers many possibilities. Cycling with lots of cycle routes throughout Zeeland, unspoilt nature reserves and large beaches, to Zeeuws Vlaanderen with the foot / bicycle ferry, the station to the Randstad. There are many beautiful places to visit from Vlissingen. Whole Walcheren is interesting, such as Middelburg, Domburg, Veere, Oost- and Westkapelle and Zoutlande. Besides the fact that Vlissingen offers everything within walking distance from the house. Boulevard, museum, recreation, hunting, shed and fishing ports. Shops, cinema, beach and old monumental buildings. In order to provide you with a good service and to receive you, we have made our host Lia available to you. You can reach her on 0031 620 18 69 56 regarding arrival departure etc. Upon your arrival, the beds will be nicely put up for you. This service is included. The towel set is also ready for you. The minimum rental period is 3 days. The standard arrival days are Friday and Monday. During holidays and quiet periods, we can make customized arrangements for you. In the high season we rent out the house per week. For direct booking of the property you can choose to book & pay. You then have the choice to pay with iDeal (in the Netherlands only), credit card or bank transfer. Please note: the service charge to HomeAway can only be paid by credit card when booking directly. Are you not in possession of a credit card? Then do not choose to book directly, but send us a message with your reservation request. We will then send you the bank details by e-mail and respond with a confirmation of your request. The minimum rental period is 3 days. The standard arrival days are Friday and Monday. During holidays and quiet periods we can make customized arrangements for you. In high season we rent the house in principle per week. Due to the many requests and crowds in July and August, we use the Fridays as arrival date in these months. If you wish to deviate from this, please contact us for possible options. A shower cabin, spacious bath with hand shower and a sink on a bathroom furniture. All taps are mixer taps. Our hostess Lia is there to welcome you on your arrival and to guide you. When you leave, she is back again to receive the keys, parking pass etc. again. Das Appartment in top Lage im Zentrum hat uns sehr gut gefallen, es ist sehr geräumig und ausgezeichnet ausgestattet. Die Übergabe hat reibungslos funktioniert. Wir haben uns sehr wohl gefühlt. Es ist alles für einen angenehmen Aufenthalt vorhanden. The home is just gorgeous and we felt immediately at home. The interieur is very tasteful and looks very much like on the pictures. You will find everything you might need for your stay. The kitchen is full functionning and everything is there to take care of yourself. The two bedrooms are spatious and have comfortable beds. We slept very fell. The house is located in a pedestrian zone and you will find many shops (e.g. bakery, supermarket) in a walking distance. Many more lovely places are also in walking distances. We enjoyed a long walk at the beach which is also very nive in winter time. We are looking forward you and your family meeting again. Uitstekend gelegen, ruime kamers en alle comfort is aanwezig. Goed uitgeruste, ruime en charmante woning. Bovendien ideaal gelegen. Vielen Dank für Ihren Besuch bei " aan Hooger Wal". Wenn Sie irgendwelche Wünsche haben, lassen Sie es uns bitte wissen. Wir hoffen, Sie wieder zu empfangen. Die Wohnung ist hell,funktionell und geschmackvoll, modern eingerichtet. Die Lage ist sehr gut, direkt in der Fußgängerzone, die Parkplätze sind ca. 70 Meter entfernt. Zum be und entladen kann man bis auf 20 Meter heranfahre. Der Kontakt mit dem Vermieter war sehr gut und Fragen wurden schnell beantwortet. Ein sehr schöner Urlaub in angenehmer Umgebung, den wir gerne jederzeit wieder buchen würden. Vielen Dank für Ihren Besuch bei "Hooger Wal" und die Komplimente, die Sie uns gegeben haben.